You may be feeling a little burned by EA’s recent Dungeon Keeper mobile release. It’s the first new game in the franchise for 15 years and by all accounts it’s a soulless, microtransaction-filled grind. Boo to you, EA. Boo to you. Happily, in the complete opposite end of the marketing spectrum, Andrea Mauro has made a Dungeon Keeper clone with Starcraft 2’s modding tools. He’s released it through the Arcade so anyone can play it, whether they own Starcraft 2 or not. It will be instantly familiar to anyone who played the original Dungeon Keeper. 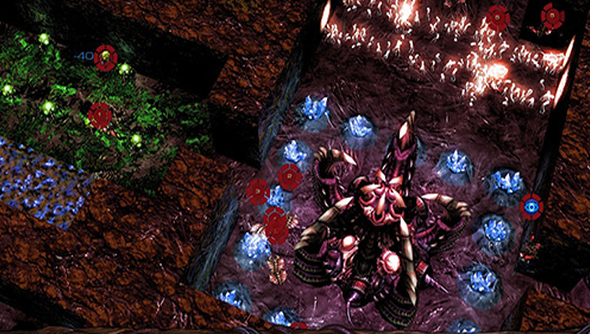 You don’t control your zerg drones, instead you mark out where needs to be excavated and they will go to task. The gas they harvest is used to equip rooms with different gear, allowing the space’s to be used for different purposes – training, storage, trapmaking. Lots of fun stuff. Blizzard recently made the Arcade a part of the Starcraft 2 Starter Edition, which is a cutdown, free version of the main game. If you download it you can access Hive Keeper and all the other mods that have been made for Starcraft 2 so far.